A brilliant and fun present that is guaranteed to raise a smile from the recipient - and passers by! 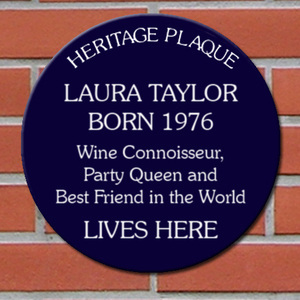 These spoof personalised blue plaques are designed to look just like the iconic blue heritage plaques you see on the front of houses in which famous people once lived or stayed. 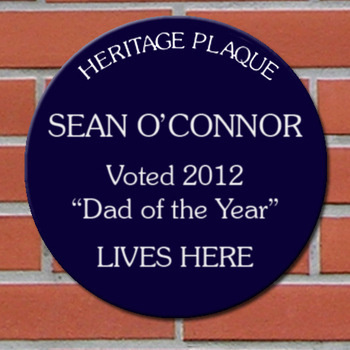 Created just for you from super strong 3mm blue acrylic, these plaques will last for years without fading or rusting. All it might need is an occasional buff with a soft cloth to keep the neighbours envious and wondering! 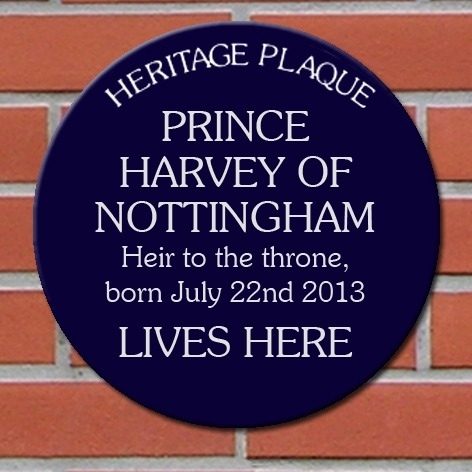 The plaque features the wording "Heritage Plaque" across the top, but the rest of the wording is entirely up to you! You have space for around 6-7 lines of text, including the recipient's name. You don't have to include their date of birth (they might not necessarily thank you for it! ), but you can have fun creating text that has just the right combination of formality and sheer daftness! Measuring approximately 20cm (8") in diameter, your plaque is light enough to be fixed to the wall with adhesives. Alternatively, you can easily drill small holes so that it can be mounted with screws (just attach a little masking tape before drilling the holes). If you want to display your plaque indoors (and keep your light under a bushel), it is light enough to be attached to the wall with sticky pads or blue tack. How to Order: Simply click on the button below to proceed to the shopping cart. Once there, use the box provided on the form to enter the wording you would like to appear on your plaque. If you would like part of the text to be in capital letters please type it in this way when entering the information in the box. Important: please, please double check your spelling, capitalisation, and punctuation because once the order has been placed and the plaque created, mistakes cannot be rectified. Once your plaque has been dispatched I will email you to let you know that it is on its way! "We all try to out-do each other in prezies, trying to find 'different' things and he loved the plaque. This personal contact is so refreshing - thank you. It's one of the best, most personal services I've ever come across - so human! I'll be sure to recommend you to my friends." "I just wanted to let you know that I received the plaque in the post today and it looks brilliant, thank you again for everything!" "My order arrived this morning, carefully wrapped & sent by recorded delivery. The plaque itself was absolutely brilliant, I'm thrilled with it & I'm sure my friend will love it too. A big thank you for rushing it through & getting it to me well before Saturday...you've saved my bacon! I'm sure I will be back to order again in the future & it goes without saying that I will recommend your company to my family & friends. Thank you again."